1.Prepare Sauerkraut: In large skillet, melt butter over medium heat; add onion and cook 8 to 10 minutes or until onions are golden brown. Stir in sauerkraut, sugar, salt and pepper, and cook 2 minutes, stirring frequently. 2.Meanwhile, prepare Beer-Brats: Heat oil in large saucepot over medium-high heat. Add bratwurst and cook 3 to 4 minutes or until browned, turning frequently; remove bratwurst. Add peppers and onion to same saucepot and cook 5 minutes or until tender, stirring frequently; stir in salt and pepper. 3.Add beer and bratwurst to saucepot. Heat to simmering over medium-high heat; reduce heat to medium and simmer 9 to 10 minutes or until internal temperature of bratwurst reaches 160°. 4.Strain bratwurst and vegetables; discard beer. 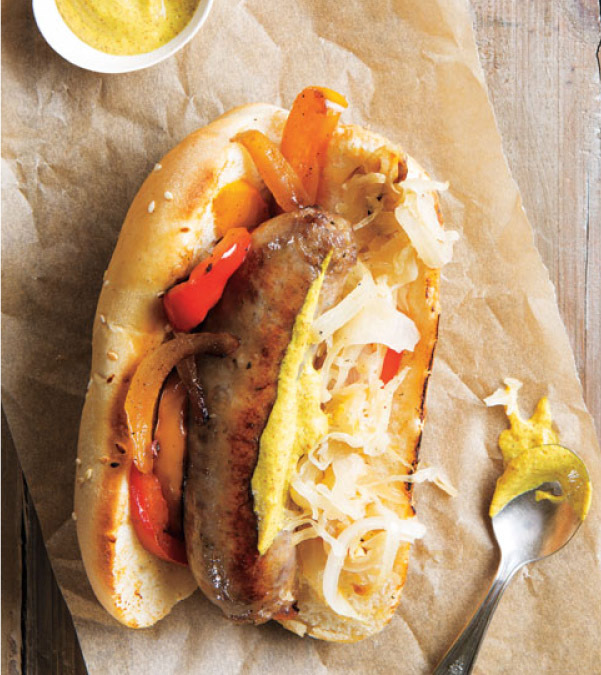 Serve bratwurst and vegetables in buns topped with sauerkraut and your favorite spicy mustard.